Solid State, Thin-Film, Solar Cells, providing an excellent choice for applications that require lightweight, flexible, durable, silent power. Recharge a bank of batteries to provide power for lighting, ventilation, field communication radios, satellite phones, laptops, GPS units, etc. Combined with ETI's line of Solar Charging Systems, it can provide 110 or 120 VAC for extended periods. It supports rapid deployment and remote locations with quick solar electric power generation. 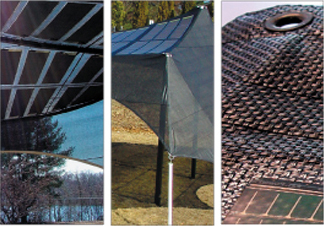 Integrates lightweight, rugged TacticalSolar® flexible solar panels directly with fabric. 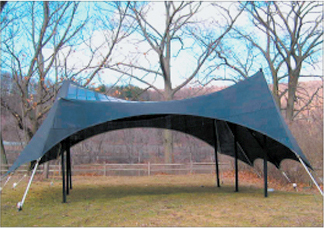 Field Shelter designed for easy & quick set-up. Features the same rugged PVC-coated tan fabric standard on other field shelters. Non-reflective solar panels with matte finish. Available in various fabrics and colors. This product is expected to last as long as tents without the integrated solar technology. * Operating voltage and current at AM 1.5. 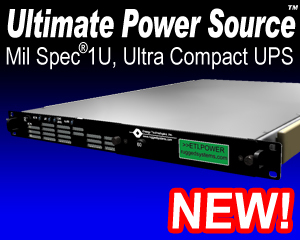 Power performance may vary +/- 10% due to temperature variation, spectral variation, and related effects. Click HERE to download a PDF with information on the ETI0021-0054.